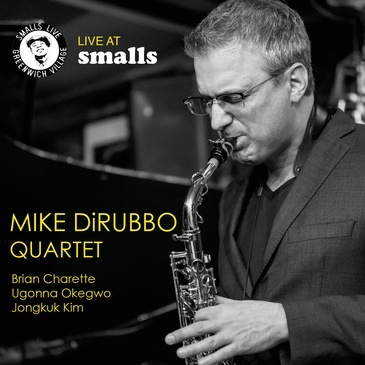 The alto saxophonist Mike DiRubbo has been on the verge of a breakout for some time. The now forty-eight-year-old alto saxophonist has a clean, biting sound. One is reminded of one of his mentors, the late Jackie McLean. DiRubbo began his musical studies on clarinet and eventually moved to his instrument of choice, the alto, when he was twelve. A life changing experience with the Mitchell-Ruff group while he was still in high school convinced him that music was his life’s calling. After high school, DiRubbo studied at McLean’s Hartt School of Music at the University of Hartford in his home state of Connecticut. McLean saw something in the young man’s playing that reminded him of himself. The master’s intuition has proven to be prophetic. DiRubbo graduated from Hartt in 1992 and after working for a couple of years with local musicians in Connecticut, he eventually made his way to the Mecca of jazz, New York City, in 1997. DiRubbo has sharpened his skills on the whetstone of gigging with some of New York’s premier jazz players like Al Foster, Jimmy Cobb, Harold Mabern, Eddie Henderson, John Hicks, Peter Washington and Carl Allen to name a few. His hard work has paid off giving him a distinctive hard-edged sound that both honors the tradition and launches the music into the era of modernity. The critics have noticed. DiRubbo has been a nominee for Downbeat’s Rising Star on Alto Saxophone for the last six years running. He has worked extensively as a sideman on albums led by modern artists like trombonist Steve Davis, keyboardist Brian Charette, trumpeter Jim Rotondi and bassist Mario Pavone. The altoist has released several albums as a leader and started his own record label, Ksanti in 2011. Ksanti means “patience” in Sanskrit and with such an impressive resume and his latest release, Mike DiRubbo Quartet Live at Smalls, that patience may finally be rewarded with the accompanying recognition that he so richly deserves. As the title implies this is a “live’ recording, capturing the moment of spontaneity and excitement that happens when a group is in sync and spurred on by an appreciative audience. This release is very current having been recorded at Smalls Jazz Club in Greenwich Village in December of 2017. The group is stellar. Pianist Brian Charette sheds his organ and synthesizers for a night of acoustic piano and the results are impressive. The rhythm section of Ugonna Okegwo and Jonkuk Kim keep the energy high and pulsing. Smalls, ans an intimate, basement club that has a capacity of sixty, is the perfect venue to listen to and appreciate a group like this. You get a chance to get upfront and personal with the band. A chance to listen and watch undistracted as DiRubbo and his group explore the possibilities of the compositions that they play. From the driving opening bars of “Hope” you get the sense that this is going to be a special set of music. There is a Coltrane intensity and DiRubbo’s horn, at times almost sounds like a tenor; sharp, sometimes ragged, ripping through the lines like a serrated knife through crusty bread.Okegwo’s pulsating bass lines lead the way.Charette’s piano comps are thoughtful and measured and he offers a shimmering solo of cascading notes. Drummer Kim is a bundle of cacophony that keeps the proceedings percolating just to the brink of a boil. “Details” uses a repeating rhythmic motif over which DiRubbo’s alto blows, first stating the line and then exploring its modal possibilities. You can hear the strong influence of his mentor Jackie McLean here. His notes are articulated like short staccato stabs, often accentuated with snare drum jabs by drummer Kim. When the altoist goes off, his cutting sound connects longer runs of notes played with a force that implies urgency. Charette takes an inspired solo that features a flow of notes that pour from his keyboard like the water of rushing stream before setting up for a pensive bass solo by Okewgo. As the song closes DiRubbo reaches the higher register with intense wailing sounds that are reminiscent of some of Pharoah Sanders’ plaintive cries. The cd continues with “A Blues.” The song has a swinging feel and each musician takes a turn in the solo spotlight. Okewgo’s bass is strong and pulsing and Charette's musings hold your interest with an economy of notes and some nice tremolo effects. DiRubbo’s alto is sinewy, his facility always at the ready to produce a flurry of notes when the mood suits him, or he will dynamically leave some space when effective. “Moving In” is a soulful, ruminative ballad that features some of DiRubbo’s most sensitive playing. The rhythm section holds down the waltz-like pace as the altoist is given a chance to wander around the melody expressing a variety of ideas that all have an emotional appeal. His horn pleading in its tone and phrasing. Okwego’s bass is robust, dancing around the rhythm in a free-spirited prance that is loose but never loses the tempo. “Pent-up Steps” is a derivative of Coltrane’s “Giant Steps” and shows the group in top form. DiRubbo’s alto navigates the changes with a slipstream ease. Gushes of sound come pouring out of his horn in deluge of ideas, building in intensity, surging with screeching, high-register notes at the apex of his solo. The rhythm section keeps the pace and defines the changes. Pianist Charette artfully offers a series of beautifully executed ascending and descending runs. Drummer Kim, given his chance to shine, produces a polyphony of beats accented by some shimmering cymbal work, before the group heads for the exit at the coda. The late guitarist John Abercrombie had a way of composing endearing music that often had a touch of introspective melancholy to it. It’s no wonder that the group rises to the occasion and delivers one of their most memorable performances on his composition “As it Stands.” DiRubbo’s alto is particularly moving, his tone and attack delivering the pensive, moody feel with great insight and authentic feeling. Charette’s poignant solo is a highlight and Okwego’s bass sings with its own sense of deeply felt emotion. The final song of the cd is “Archangel.” DiRubbo uses the thumping beat of Okwego’s bass, the roiling drums of Kim and the deftly placed comp chords of Charette to go off in an intense, ‘sheets of sound’ deluge of notes on his horn. As the record memorializes,this is a group that thrives in the intimate setting of a club like Smalls. The chemistry is potent and DiRubbo delivers a set of powerful music that relishes intensity while still leaving room for the sensitivity that a good ballad requires.